but also provides in-depth reports on topics of tourism, nature, people and history in Namibia, as well as on key issues such as land reform or genocide during the colonial era. For designing brochures, Bush Telegraph Namibia cooperates with designers; for websites it is teaming up with web designer Gunnar Heussen of Heussen Media. If complex English texts are required, a translator is called in. 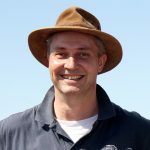 Born and raised in Hamburg, Sven-Eric Stender (temporary name: Sven-Eric Kanzler) came to Namibia in 1986 and started his career in journalism at the German radio service of SWABC (now NBC) in Windhoek. After studying in Stuttgart and working as a freelance news editor and presenter for the private regional radio station Antenne 1 Stuttgart, he returned to Namibia in 1998 and spent two and a half years with the Allgemeine Zeitung as news editor and chief on duty. In March 2001 Sven-Eric Stender founded his media office Bush Telegraph Namibia and focused on reporting for radio, newspapers and magazines in Namibia, South Africa and Germany about travel-related topics. As from 2002 tourism companies (e.g. Waterberg Wilderness) contracted him for marketing projects such as producing brochures and constructing websites. For seven years Sven-Eric Stender worked almost exclusively for the lodge group Gondwana Collection as a PR consultant – in close collaboration with the marketing department. In January 2013, Bush Telegraph Namibia took over the marketing and public relations for Waterberg Wilderness and Ondekaremba Lodge & Campsite; in March 2016, Ghaub Nature Reserve & Farm was added to the client base. In addition, the media office contributes Namibian stories to the news of the German-speaking private radio station Hitradio Namibia in Windhoek. Bush Telegraph is also responsible for the sections about travel and activities of German institutions in Namibia in the quarterly Namibiamagazin of the German-Namibian Society in Germany. In fact, this cooperation dates back to day one of the media office. Occasionally Sven-Eric Stender still supplies the Allgemeine Zeitung and the lodge group Gondwana Collection with features.